Gustave Doré‘s caricature of Münchhausen  is one of the illustrations from Les Aventures du Baron de Münchausen (1862), translated by Théophile Gautier, fils. 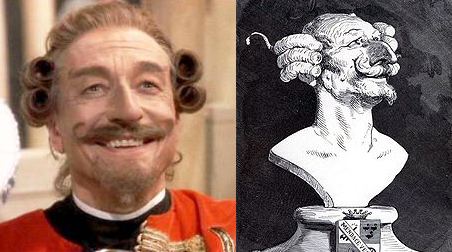 It served as an inspiration to Terry Gilliam‘s film The Adventures of Baron Munchausen to style John Neville as the baron . See also Bust (sculpture), Periwig, Friedrich Nietzsche and free will. This entry was posted in Uncategorized and tagged fact and fiction, Münchhausen, Nietzsche, nothingness, philosophy on April 24, 2013 by jahsonic.